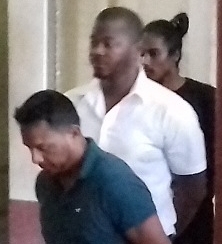 Thirty year old Juan Anderson and thirty three year old Damion Williams stood before Chief Magistrate Ann McLennan in the Georgetown Magistrates Court and denied a drug trafficking charge that was laid against them. The charged read that on December 24 (Christmas Eve) they had 65.027 kilogrammes of cocaine for the purpose of trafficking. Reports are that on the day in question, Police acting on information received went to the home of Anderson and conducted a search on his premises. The said drug was found in Anderson’s car sealed in a gas cylinder. The said cylinder was taken to the police narcotics branch where it was searched and 59 parcels with white like substance was found. It was checked and tested positive for cocaine. Anderson in a caution statement identified Williams as the person that gave him the item. In turn Williams, in a caution statement, had admitted to giving Anderson the said items.